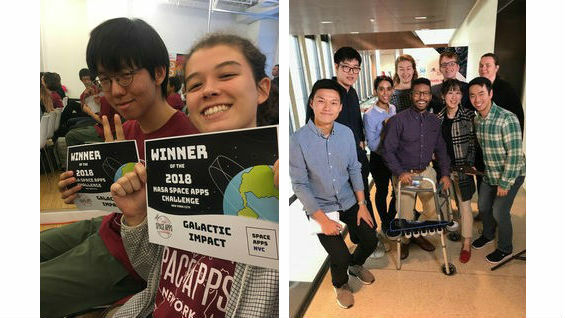 Two Cooper Union engineering students, Hannah Quirk ME'21, and Minyoung Na BSE'20, teamed up for the NASA Space Apps Hackathon in New York on October 20-21, 2018. 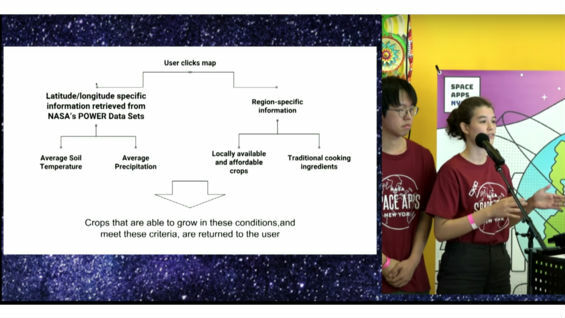 They were awarded the "Galactic Impact" prize for their app, "Demeter" that aimed to use NASA satellite data to optimize food production for refugees. 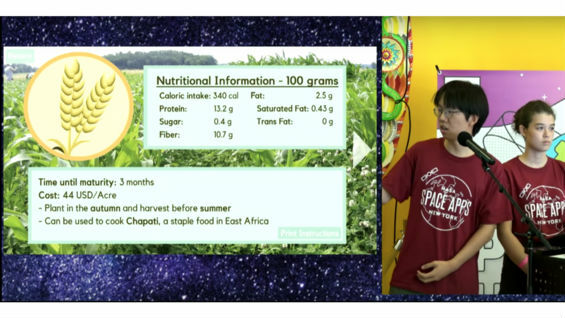 The app they designed allows the user to select any location in sub-Saharan Africa, and depending on the location and season, the app will suggest an optimum crop to produce with nutrition information, cost, and duration of growth. The selection is based on the historical weather data, such as average temperature and precipitation, which are collected from the NASA satellites, and they compared the data to optimum growth conditions for locally available crops. The prize they received is awarded to the app that judges decide will most likely create positive change in the world or have the greatest impact on people who are in need. Hannah and co-creator Brian Chung EE'21 won the top prize at the 2018 Invention Factory for their invention Twist Talk, a portable communication aid for children on the autism spectrum. Ten Cooper students participated in the Mount Sinai Health Hackathon on October 19-21, 2018. There were a total of 15 teams with members from various Engineering and Medical schools across the Tri-state area. 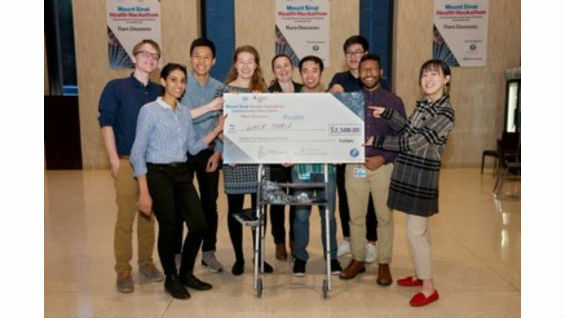 Mechanical Engineering students, Jiaqi (Kino) Shen ME'19 and Gregoire Caubel ME'20, were members of one of the top three teams that won a $2500 prize and an invitation to Mount Sinai Innovation Showcase in February 2019 to present their work. 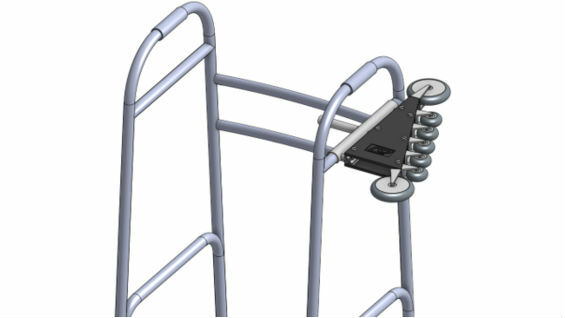 This year's theme was Rare Diseases and along with other members, Jiaqi and Kino created "Walk Thru", an assistive device that can be augmented to a mechanical walker to help patients with neuromuscular disorders, such as Huntington's disease, go through self-closing doors much smoother, decreasing the possibility of complications. At the Showcase, the teams will receive feedback from a panel of judges from the NYC life sciences ecosystem. This is the second consecutive year that Cooper Union students have made it to the finals. In 2017, Simon Shao ME'19 and his team "Helping Stand" were named as one of the three finalists.